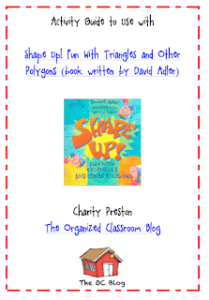 You are here: Home / 3-5 / Polygon Teaching Ideas! I don’t know about everyone else, but it sure its hard getting all the subject areas in during the day sometimes! I like to integrate my subjects as much as possible by incorporating literature into all the other core subjects as well. In this way, students can begin to see that even in math, reading can be included and that math is not always done with just paper and pencil work. Using reading in your math lesson plans, and math in your reading lesson plans becomes a win-win. The bonus factor? Students start to also see how everything you do in your classroom is connected as well! So, today, I grabbed a book off my bookshelf that I have used throughout the years in my math classes when introducing polygons to students: Shape Up! Fun With Triangles and Other Polygons by David Adler. This book is so much fun for the students! It introduces these simple geometry ideas with hands-on activities using FOOD! Food always gets the students’ attention and this book includes using cheese, pretzels, and bread to teach the lessons. Want some more polygon fun goodness? Check out these fun games! Love this one for basically any subject, so it’s perfect for geometry vocabulary or showcasing polygon shapes too! This is a fun way to practice having sets of like and unlike items: Odd One Out with Polygons! This polygon memory game is pretty awesome too! Have Fun Teaching always has great music videos! I love how the words are on the video in this polygon math video – that way students can sing along! And a bonus: A polygon chart! Sometimes just having something that is visual in nature helps students to “see” what they are trying to comprehend. This freebie chart is wonderful for sharing with your class! 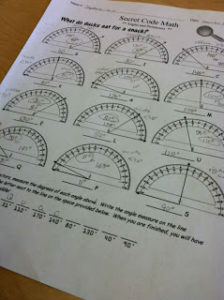 What other ways do you use to integrate reading and math when teaching about polygons in your lesson plans for math? Feel free to leave a comment and share below! I hope you enjoy your freebie from me and happy math-ing!